I love vegetables! I am inspired by their colors, textures, tastes. You can do so many things with vegetables that make them the main dish instead of just being a side. I typically try to eat 3 or more vegetables for lunch and dinner and 1 or more vegetable for breakfast. This way I am fueling and nourishing my body with nutrients that help everything from my cells, to my bones to my brain be stronger, more hydrated and balanced. Try some of my favorite veggie based go-to meals that always taste so amazing and leave my body feel clean and nourished. Follow the directions of your spiralizer to make think noodles. I use this Kitchen Aid attachment and love it! Cook in the oven for about 15-20 minutes. I like to make sure they have s slight crunch to them so that they have some body and can hold a sauce. Add your favorite protein and sauce and enjoy! Spaghetti squash is a great staple in any week night meal. I also LOVE pesto and this meal feels like healthy comfort food. Place spaghetti squash on a cookie sheet and place in the oven for around 45 minutes. It is time to take the squash out when a fork can easily pierce through. In a sauce pan, add chopped garlic and olive oil and cook until the garlic becomes translucent. Add the broccoli rabe to the garlic and olive oil mixture and sauté for a few minutes until the broccoli rabe is at your desired texture. Remove spaghetti squash from the oven and let it cook. Use a fork to comb through the squash placing this pasta like fiber into a separate bowl. Then add the broccoli rabe, chick peas and then evenly mix the pesto. Wash and chop the broccoli and cauliflower into small florets. Evenly place vegetables on a cooking sheet and roast for about 30-minutes. Take vegetables out when they are browned with a slight crunch. Meanwhile, on a separate pan, place cooked chick peas and roast until they have a crunchy flavor and start to dry out. This should take around ~15 minutes. In a small blender, combined the ingredients for the tahini sauce and adjust the flavoring to your desire. When the roasted vegetables and chick peas are done, place everything into a bowl and pour in the tahini sauce to coast everything evenly. Add additional salt and pepper to fit your flavor profile. You can follow this same recipe with different vegetables and protein. For instance, try a different legume or use a chicken breast. I also love doing this recipe with butternut-squash and onions or brussel sprouts and sweet potatoes. I love cookie dough! So anytime I can eat it and feel re-fueled, I am all in. This is a simple recipe that can take 10 minutes to bust out and then you have protein balls ready to enjoy for the next few weeks. In a bowl combine cashew butter, with sweetener. Add coconut flour and stir until the batter is thick enough that there is no dough sticking to the sides of the bowl. Place in freezer for 20 minutes and then store in an air tight container in the fridge or keep them in the freezer. I am addicted and love to eat them as an afternoon snack or as a sweet treat with my coffee. They beat buying a gross bar or empty afternoon cookie. Try them out and let me know how they go. I lovvveeee the zoodle invention and I forget how easy, nutritious and delicious it can be for a quick dinner or potluck creation. This weekend I was inspired to get into the kitchen without turning on the oven since it is so hot. Yet, I wanted to make a delicious meal. Instead of wasting time setting up my spiralizer (which in reality only takes a few minutes). 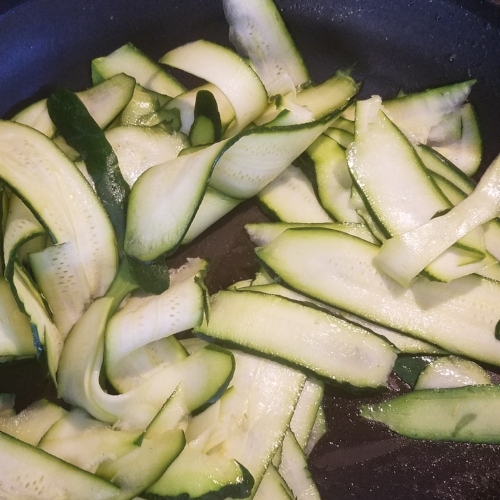 I took 4 medium sized zucchinis and used a vegetable peeler to create pappardelle sized zucchini noodles that were so delicious! I lightly sautéed them in olive oil for 2 minutes until they lightly softened and turned a brighter green. 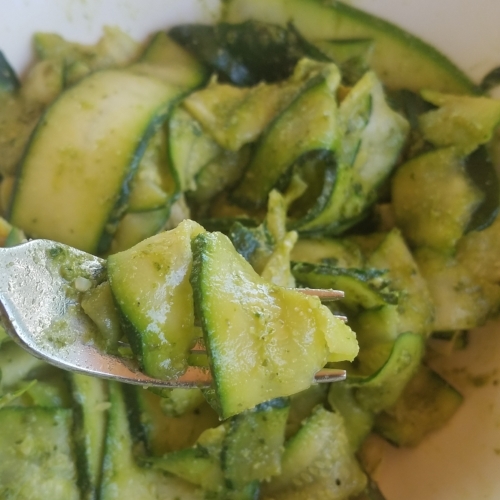 I then mixed these zoodles with a homemade vegan pumpkin pesto that was so delicious I keep using the leftover pesto as a veggie dip or I mix into salad dressings. *Adjust consistency to your liking. 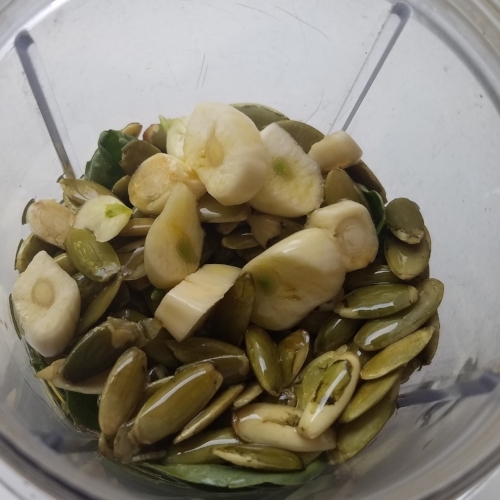 If you want it thicker, add more pumpkin seeds. If you like it thinner, add more olive oil. In a big bowl, I combined the cooked zoodles with the pesto and added a bit more salt and a 1/4 of avocado, because avocado goes well with anything. Bonus! 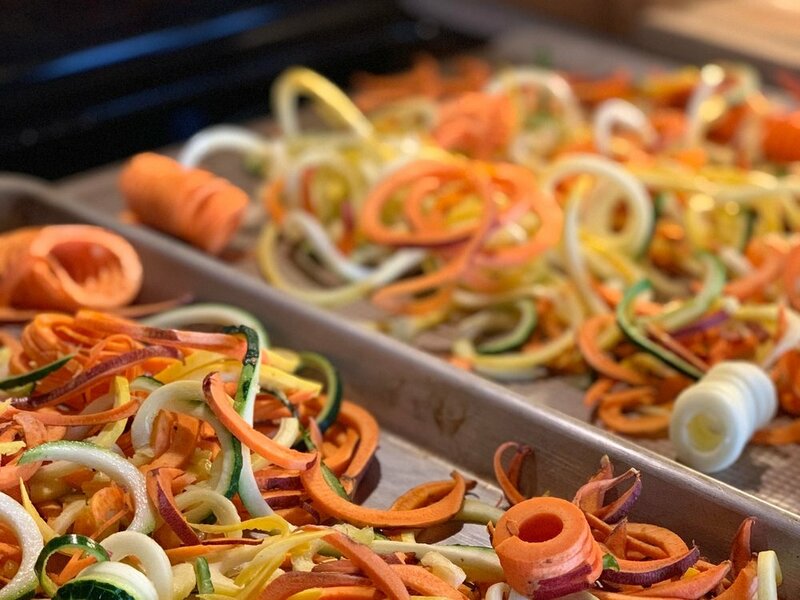 Since using the veggie peeler on a zucchini can be difficult to use the entire vegetable and I don't want to waste food, I use the left over zucchini scraps and saved them to roast with other vegetables for another meal. Two meals in one. Say whattt! Zucchini, sweet potatoes and onions with olive oil and salt on 400f for 30 minutes. Summer is here and the livin is easy. While I am soaking up the summer sun at an all day BBQ or hanging by the pool I crave something refreshing and delicious. Rose is delightful, but sometimes I am not in the mood to drink, yet I want to feel festive. I was recently inspired by this Beet Mint Lemonade I had Deru Market for brunch. So this MDW I was inspired to whip up my own version. Garnish with extra mint & enjoy! Although I didn't try it, I could see this drink being pretty tasty with a splash of vodka as well ;). The fresh beet and strawberries make this drink full of vitamin B, C & K as well as the beet and lemon bonafides that support liver detoxification. Let me know your thoughts when you enjoy this summer mocktail (or cocktail). This week is one of my very favorite weeks: my ‘anti-inflammation’ week for my mind, body and soul. I try to reduce inflammation in my physical, mental and emotional system to prime myself for a cleaner and clearer slate for the new year. Join along and let me know how you feel as you step into 2018! These days are the last few pages of the 2017 chapter—a time to simmer in the holiday warmth, finish up any loose ends and start to dream-storm what 2018 gets to look like. I consider this week holy. Time feels slower, emails are quiet, more reading gets done and there is a natural cheer in the air, filled with Happy New Year wishes. The holidays can be a whirlwind—travel, different routines, rich and decadent food can throw you off your game. No matter how mindful you are. But practicing some intentional self-care can put you back on track and in the driver’s seat so you can head into 2018 feeling your best. Being consistent with my daily meditation practice is a game changer, even if I can only fit 10 minutes in my morning routine. Not only do I feel calmer and clear-headed, but I also notice I am less emotionally reactive and manage stress more effectively. My meditation practice doesn’t just make me feel good, I know it is also doing good for my brain. A study conducted by Carnegie Mellon demonstrated that participating in a 3-day mindfulness meditation retreat generated more functional connectivity between areas of the brain and showed lower levels of inflammation in blood work than a similar demographic of people who completed a 3-day, relaxing mindfulness retreat. This research proves the importance of a meditation practice. It can have a positive impact on one’s physiology and actually reduce inflammation in the mind and body. I’m especially amazed that in just 3 days the scientists could detect a difference in the participants’ biochemistry. Meditating not only feels pleasant, but I consider it a routine, just like brushing my teeth. Meditating reduces brain inflammation, just like brushing my teeth reduces gum inflammation, and my practice leaves my mind feeling minty fresh and clean, just like after a good tooth-brushing session. Staying consistent with my morning meditation routine re-grounds me so I can feel more mentally refreshed and open to the possibilities of the New Year. I don’t believe in diets or restricting myself (because life is too short to not enjoy!). However, I do believe in mindful eating and making more intentional food choices based on the wisdom and cravings of my body. For instance, post holiday ho-down, I typically notice I feel sugar-overloaded, dehydrated, and bloated. Sound familiar? Usually this combination is the result of eating more decadent food than I am used to and not being as physically active. That’s why in anti-inflammation week, I make sure to focus on what I am fueling myself with and how I move my body. The magical three fueling tips, I practice this week are WSC—hot water, soup and cruciferous vegetables to restore my body’s equilibrium. 1. Water — especially hot water! with lemon, ginger and a cinnamon stick. This 3-some aids in digestion and reducing inflammation. I drink this first thing in the morning and continue to re-fill this concoction with additional hot water throughout my day. 2. Soup — I love how comforting, nutrient-dense and filling soup can be, especially when it is non-dairy. I prefer to make a bunch of homemade soups so that at least one of my daily meals can be soup-based, to support my digestive track getting a bit of a break. Some of my go-tos are homemade chicken vegetable, lentil sweet potato or broccoli. 3. Cruciferous veggies — at every meal. These vegetables are typically what you think of when you imagine fibrous vegetables: kale, broccoli, cauliflower, bok choi, broccoli rabe, brussel sprouts, cabbage, etc. Research suggests that a phytochemical, sulforaphane, found in these veggies have endless health benefits that helps detoxify the body’s system. I make sure to have a medley of different vegetables throughout my week. And of course I sweat! This week I tend to be less in the yoga and Pilates mindset and crave more cardio classes such as spin, speed-walking or a run. Sweating is key to flushing out the lymphatic system and getting my blood flowing to help cleanse and neutralize my internal bio-dome as much as my emotional and mental. Slower, colder and quieter days call for space to be introspective and creative. Typically I love to be creative in the kitchen, but post the holidays, I try to keep it simple so my creative outlet gets to come alive in the form of writing or collage-making. I spend time letting my mind wander and connect to my voice. This sometimes comes out in the form of free-writing, poetry or a personal story. This week, building my 2018 vision board called my name. I rummaged through old magazines and selected what images stand out for my 2018 mindset and inspiration. Due to all of the holiday parties and festivities, I crave to be a bit more introverted this week. I minimize the desire to numb or mask my true emotions with social media or Netflix-binging and instead, go inwards to connect and have my soul goals listened to and honored. I cut through the inflammation of the loud external world and work on dialing it in to what truly matters. Intentionally making space to take care of myself in this holistic fashion honors my 2017 and is the best investment I can make for my year to come. How are you honoring your 2017 while gearing up for 2018? Share with me in the comments below. July 4th is just a few days away. What are your plans to celebrate? Whether you are going to light a sparkler or not, this long holiday weekend is the perfect time to think about how you celebrate the little and big markers in life. For instance, we are officially halfway through 2017. Instead of racing through the second half of the year, I want to welcome you to take a moment to pause and reflect on all you have accomplished this year, big or small. Take 5 minutes right here, right now to brain-dump all of your accomplishments. Maybe you moved cities, changed jobs, met your savings goal, made three new friends, got an award at work, tried a new workout regime, went on a date or started cooking more at home. Whatever you accomplished, make sure to CELEBRATE! If you set your 2017 word of the year, take a moment to look back at your intention and check your alignment. Do your current accomplishments line up with the essence of your word? If you have been consistently practicing and connecting to your intentions, it is pretty amazing to see what happens when you stay focused. Now, when it comes to celebrating, there are so many ways to do it! 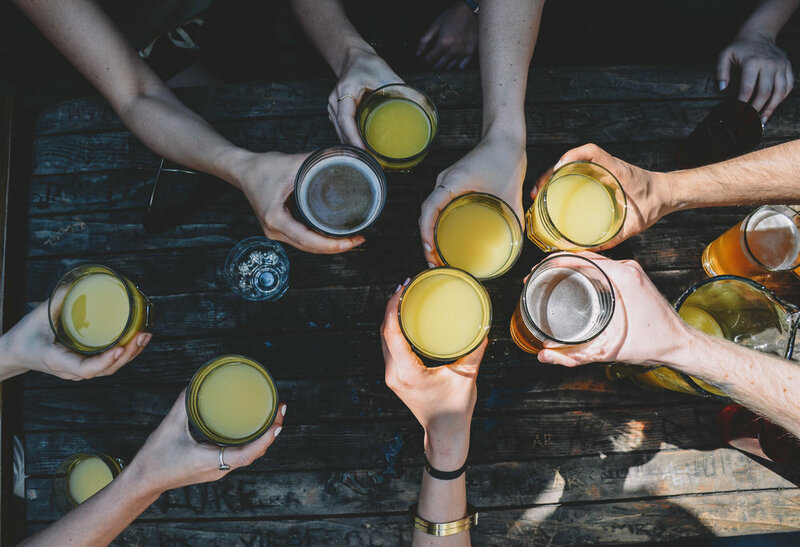 You can scream and jump up and down like you won the lottery, you can call loved ones to share the exciting news, you could treat yourself to an indulgent day at the spa, or go out to a delicious dinner. How do you celebrate? Personally, I love celebrating big and small milestones with food! Food is a creative expression that gets to create connection and a shared experience for all of those involved. So, whether you are celebrating the 4th of July, that we're halfway through the year, your individual accomplishments or just the fact that it is summer, think about how you want to celebrate. If you also love celebrating with food, check out my Summer Fuel Pinterest board for some delicious BBQ and summer-inspired recipes. I am celebrating the launch of my new meditation podcast! Woohoo! Centered int the City Podcast is a place and virtual space for you take a mindful moment, pause and connect. This podcast is full of modern meditations you can practice anywhere at any time. All of the meditations are geared to supporting you navigating the twist and turns of living in the rhythm of the city. If you are interested in celebrating with me and helping to spread the word, email me here and you will enter to win some prizes! I will be sending another email when it officially launches in a few weeks. I am also celebrating my up coming meditation workshop at The Riveter on July 12th. If you haven't heard of the Riveter yet, it is an amazing co-working space designed by women for women, emphasizing wellness in the workplace. If you are in the Seattle area, I would love to see you there! I will be leading a 45-minute workshop combining light stretching, meditation and discussion. It is a great way to break up your week and feel more energized and centered (without having to put on activewear). Finally, I'm celebrating that I reached a personal financial savings goal! In January, I had a clear understanding of the total amount I wanted to save by July 1. I divided that total by 6 months so I knew exactly how much I wanted to save each month. Breaking this big financial goal into mjni-goals made it feel more attainable and realistic. There is so much power in getting clear about what you want and going after it! All of these celebration align to my 2017 word, abundance, because I have stepped outside of my comfort zones, connected to the plethora of opportunities and felt the freedom of choice. I am looking forward to celebrating all of this and so much more over several BBQs filled with family and friends this weekend! I'd love to hear what you are celebrating and how you are celebrating! Feel free to share on social media and tag @onewade #SummerofSelfCare. In times of instability, I pay attention to what fuel I'm putting in my body because I know it effects my mood, emotions and overall energy. For the past few weeks, I have noticed my body craves more soups and fats and is less hungry for a full, balanced meal (ie meat, veggies, carb). I have lost my appetite for salads and instead yearn for something warm and smoothing. I think some of these cravings are natural due to the winter weather; however, the instability of our government has me also searching for comfort and stability within myself. Instead of overeating on heavy carbs or overly-processed sugars to numb my emotions and feel even worse, I am flexing my mindfulness muscles and serving myself nutrients and comfort my body craves. I want to help heal, hug and support myself compassionately through this trying time rather than fill myself with fuel that makes me feel worse. Here are a few recipes I have whipped up in the kitchen that I want to share with you—with the hope they inspire you to be mindfully taking care of yourself form the inside out. Try them out and let me know how they make you feel! Do you have any other, comforting healthy recipes you want to share? Feel free to pass them along in the comments below! So delicious, nutritious and satisfying! I could have this soup every week and never get sick of its taste and texture. Prepare all of your ingredients by washing and cutting all vegetables, garlic, and ginger. 9. The soup will be ready when the lentils completely cook. They should feel soft to touch. Keep leftovers stored in a glass container in the fridge for future lunches and dinners for the week. Remember eating cinnamon sugar toast when you where a kid? It was one of my favorite weekend treats growing up. Since I can’t stomach adding raw sugar onto any of my foods, I love to create a slightly healthier twist on one of my favorite childhood snacks. 3. Let the butter melt and then enjoy every sweet and savory bite! The sweet bread with the rich, fresh and salty taste of the butter is the best combination and super comforting for breakfast. The fat helps keep me full longer and the sweet taste tickles my taste buds. This broth helps open my lungs, my nasal passageways and feels like I am fueling my body with liquid love. 2. In a pot, heat olive oil on medium then add leeks and cook until they are translucent. 7. Cover the pot and let the soup reach a boil. Once the soup boils, keep it on a simmer until carrots are tender (~15min). The longer the soup simmers the more flavorful it will become, but it is ready to enjoy at any moment! I am not usually a huge fan of oatmeal, but this oatmeal makes me feel like I am giving myself a hug from the inside out. 1. Cook oatmeal following directions on the package. Here is a simple recipe for those mornings you want a quick veggie fueled bfast to help jump start your day. In a Viatmix or quality blender add all of the ingredients until fully mixed. So smooth, creamy and delicious! Careful to not drink it too fast so your body has time to digest all of the nutrients.